One time favourite Estijaab has been omitted from the third acceptances for the Group 1 $1.5m Ladbrokes Blue Diamond Stakes (1200m) at Caulfield on February 24. Long Leaf, above, is the new equal favourite for the Ladbrokes Blue Diamond Stakes after the 3rd acceptances. Photo by Ultimate Racing Photos. Eighty-four two year olds made up the third acceptances with Team Hawkes always indicating that Estijaab would stay in Sydney and concentrate on gaining a start in the Group 1 $3.5m Golden Slipper Stakes (1200m) at Rosehill on March 24 following her impressive debut win over 1000m at Randwick on January 20. “There is no set plan and we will take it one step at a time heading to the Slipper,” co-trainer Michael Hawkes said. The Hawkes Racing Team still has plenty of ammunition with six youngsters still among the third acceptances for the Ladbrokes Blue Diamond Stakes. Estijaab was marked as the $7 favourite for the Ladbrokes Blue Diamond Stakes at Ladbrokes.com.au before her non acceptance but the Lindsay Park trained Long Leaf and Tony McEvoy’s Oohood now share the top spot at $7. 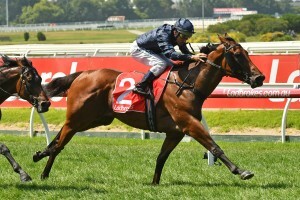 Long Leaf maintained his high standing when he kept his unbeaten record intact from three runs with his latest victory in the Listed $150,000 Ladbrokes Blue Diamond Preview (1000m) for the colts and geldings at Caulfield last Saturday. The Lindsay Park Team of David and Ben Hayes and Tom Dabernig is looking for back to back wins in the Ladbrokes Blue Diamonds Stakes after Catchy claimed the trophy last year and have sixteen juveniles listed in the third acceptances. McEvoy also has strength in numbers with twelve third acceptances headed up by Oohood who finished third to Lady Horseowner in the Group 3 $150,000 Ladbrokes Blue Diamond Preview (1000m) for the fillies at Caulfield last Saturday and Makfi colt Run Naan who ran third behind Long Leaf in the Ladbrokes Blue Diamond Preview for the colts and geldings. Ladbrokes Blue Diamond Preview runner up Ollivander is one of two youngsters from the Mathew Ellerton and Simon Zahra stable and is joined by stablemate Bionics in the third acceptances. Final acceptances for the 2018 Ladbrokes Blue Diamond Stakes will be taken on Tuesday, February 20th. Early betting for the 2018 Ladbrokes Blue Diamond Stakes at Ladbrokes.com.au: $7 Oohood, Long Leaf, $11 Ollivander, $13 High Ratio, $15 Pure Elation, $17 Lady Horseowner, Run Naan, $21 Al Naifa, Downloads, Futooh, Native Soldier, Seabrook, $26 Bondi, Enbihaar, Encryption, Lake District Girl, Hiemal, Messerschmitt, Nasaayim, Outrageous, Qafila, $34 or better the rest.